George Miller’s Mad Max: Fury Road is a two-hour white-knuckle adrenaline rush that sounds as feral and unpredictable as it looks. That’s thanks to a score composed by Tom Holkenborg, 47, the Dutch musician producer and engineer also known as Junkie XL. Holkenborg’s wide range of work includes playing in the industrial rock band Nerve, remixing the 1968 Elvis Presley single “A Little Less Conversation” to make a No. 1 hit in 2002 and working with Hans Zimmer on the score to the upcoming film Batman V. Superman: Dawn of Justice, making him a prime candidate to help Miller reboot his post-apocalyptic franchise. Miller hired Holkenborg for the job in the summer of 2013 and the two worked for 18 months melding sound and vision, developing a pulse-pound and often hair-raising score. On it nearly 200 instruments were used — many of which were played by Holkenborg — conjuring primal drums, searing guitar riffs and string and woodwind passages that recall the work of Alfred Hitchcock’s longtime collaborator Bernard Hermann. How did you come to be the composer for this movie? How could you turn that down? I was so excited, I couldn’t sleep. I came up with this whole plan about what the score could be. The next day, I delivered kind of a PowerPoint presentation and at the end of it he shook my hand and said, “I want you to be the composer on this film.” And then I flew back to Los Angeles that day. What were the challenges of composing the score for a movie like this where there’s little dialog and a lot of explosions and extremely loud noises? What it comes down to is how can you make a two-hour car chase thrilling and exciting? How do you maintain an arc that doesn’t wear people out? The movie starts to build when Imperator Furiosa [Charlize Theron] takes off with the women in the War Rig and it continues to build as the guys go out to chase her [with Max tied to the front of one of the vehicles] into a storm. At the end of that sequence, Max regains consciousness and 20 minutes into the movie we have the first moment of near-silence. So you collaborated very closely on the movie? Yes. Over the last 18 months, I went to Sydney seven or eight times and the last trip lasted 11 weeks. I packed up my whole studio, my assistants, music editor, mixers, my family and we all went to Sydney for 11 weeks. And every day George would sit with me from early in the morning until late at night to go over the scenes and see what we could do better. When we weren’t in the same place, we would Skype twice a week for hours on end. George and I both have a deep curiosity. We weren’t satisfied if a scene worked well. We wanted to know why it works well and once we’d figured that out, we wrote a mini-handbook that could be applied to other scenes. Another thing that connects us is George is extremely precise. He goes into the most insane details and that’s exactly how I am with music. When I played in bands in the past I would drive my fellow band members to absolute madness to get it right. Can you give me an example of that obsession with details? There’s a sequence in reel six when Max and the survivors are about to go back to the Citadel. It’s the last big arc of the film — about 20 minutes long — and I would say that we worked on that last 20 minutes of the film for eight weeks nonstop. He would take a frame out and then we would watch the whole 20 minutes and he’d say, “I’m missing the frame now. The scene feels too fast. He would work on it and work on it until he felt it was exactly right. And the same went for the music. It was like, “Okay, we’re now so far into the film, we’ve had so much noise, we had so much violence, we had so much explosions already — how are we going to make these last 20 minutes the most exciting 20 minutes of the film? How many musicians did you use to record the score? I basically played everything myself except for the strings and the brass that we recorded as a section in Sydney. I played all of the percussion, I played all of the guitars. I worked with Nick Zinner, the guitarist from the Yeah Yeah Yeahs on a couple of cues. He’s got this really wonderful tone, so we added some guitars. I handled the percussion, which took forever to record. The war drumming is intense. So when you see those guys drumming on the truck that’s actually you? I’m not on the truck in the movie, but, yeah, the sound is me. That alone took me weeks and weeks to record. And the guy with the flame-shooting guitar who’s suspended from the Doof Wagon — is that you, too? Those guitar riffs cut right to the bone. Oh right, because Max is tied to the front of one of those vehicles and his blood is being drained into the driver. Why is that vehicle with the guitarist and the drummers called the Doof Wagon? I used to live in Venice California and when guys would drive by in their cars with extremely loud hip hop playing where the low end rattles the windows and the whole street. I think that’s called a doof car or something like that. George came up with that. 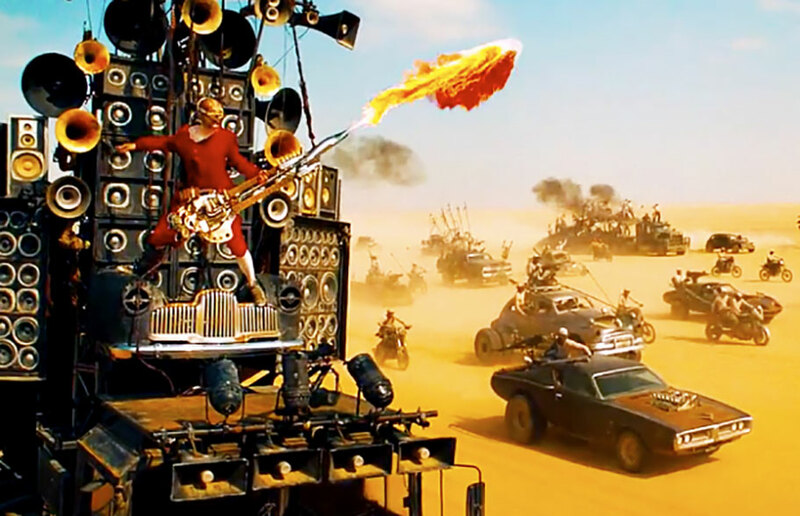 Did any other movie scores or music serve as inspiration when you were composing for Mad Max? I will say that George and I looked very carefully at some movies that were made in the ’40s and ’50s because we both have a fascination for music that was made during that time period. We listened to film composers like Bernard Herrmann, but also those from the classical world, such as Samuel Barber, who wrote Adagio for Strings. It’s a great time period and we used elements of it for Fury Road. There’s this string riff that is part of Max’s theme that is a very high, annoying pitchy sound that gets out of sync and that’s very much what they would do in the ’50s. Hermann worked extensively with Alfred Hitchcock. George and I discussed their relationship many times. It was at a point where, on the set, Hitchcock would call Hermann and say, “You know the scene that I talked to you about? Were you thinking of writing music for it?” And Hermann would tell Hitchcock, “Yeah, I have this, this and this in mind.” And Hitchcock would say, ” Good, then I’ll make the scene a little longer.” George and I talked about the same things. We took inspiration from each other’s work and we did it over and over again. And that takes 18 months. You can’t do that in a few weeks. The movie and the score really do work as a whole. When you see the film you don’t necessarily think about it in terms of, “Oh the music was great or this shot was great.” The overall experience is that the movie makes sense and you feel excited to the very end. I went to Rotten Tomatoes this morning and I saw that it was 100 percent fresh. [It’s currently at 99 percent]. I’ve never worked on a movie that was a 100 percent fresh based on 25 or 30 reviews. It’s fantastic. It’s heart warming because, after working with George on this movie for 18 months, we’ve become very good friends. I had an artist’s career for 25 years before I got into film scoring and I never felt the intensity as I do with a film like this. Have you and George talked about doing a sequel? I haven’t discussed it with George. It’s something he needs to think about, but you know, he takes his time. If you look at his IMDb page you see that he puts out a movie every five to seven years. So, maybe in 2022, you know?